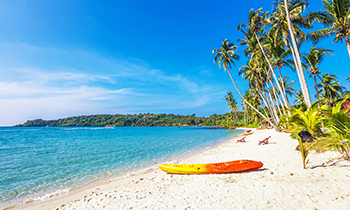 Don’t ask why Phu Quoc is always the choice of the westerners because nothing is more interesting and wonderful than laying on the white sandy beaches, bathe yourself in the sunlight, and drink coconut water. An experience in Phu Quoc of a western friend couple will answer how this island is the paradise of foreign tourists. Annek and her friend, Gabriela, left Chau Doc and took a bus to Rach Gia and then a boat from there to Phu Quoc. They found Lam Ha Eco Resort, “a beautiful place to stay, maybe one of the nicest rooms I have stayed in during my travels and for a good price ($15US), with a garden setting, and about 50 meters from a pristine beach,” Annek said. The next couple days they toured the island via motorbike, went snorkeling and found they were only two westerners there. 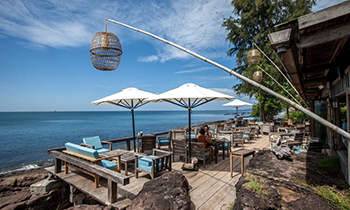 Her blog contains 25 excellent photos of Phu Quoc. Phu Quoc is an island located totally in Thailand Gulf featuring the most gorgeous beaches in Vietnam. The beaches here are very ideal for swimming and diving because the sea water is very clear and blue, the sand is white and smooth nestling in the lines of coconut trees. The largest beach on the island is Bai Truong beach, this beach is 20 km long running down the central west coast of the island, this is also the most attractive tourist site on the island. Besides that, there are numerous other beaches on the island with the pristine beauty such as Ong Lang beach, Bai Sao beach, Dinh Cau beach, etc. 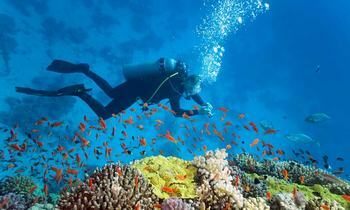 Diving and snorkeling are also the favorite activities of tourists when coming to Phu Quoc's beaches. Under deeply the heart of Phu Quoc sea, it is the lively kingdom of coral reefs and marine creatures. Phu Quoc has gotten a lot of international tourists lately, but it's not nearly as much attention as it deserves. What a treasure trove of secrets it is revealing, let’s come and explore it! Thank you!